An inviting “Garden” path in Scarborough. Photo courtesy of Mill Creek Garden Club. By Lila Johnson, Mill Creek Garden Club Publicity Chair. You’ve seen the posters, read the news articles, now it’s time to act. Gather your friends and neighbors, buy your tickets, put on some comfy shoes, lather on sunscreen or pack an umbrella—June 23, 2018, is Mill Creek Garden Tour Day. Why tour? It’s stress-free exercise in the great outdoors; it’s a chance to discover interesting yard ideas; it’s an opportunity to socialize while exploring the beautiful gardens; it’s the once-a-year fundraiser for Mill Creek Garden Club; and if that isn’t enough, there is shopping involved. Rain or Shine the six showcased gardens will be open from 11:00 am to 4:00 pm. Chat with Garden Club volunteers clad in their brightly-colored garden aprons. Visit with and ask questions of the garden owners who will be there to greet you; they’re the ones beaming with pride, and who will welcome your compliments. Be sure to have your Tour Guide in hand—it’s your entry into the gardens, which range in size from just shy of one acre to a “deck garden” overlooking the golf course and everything in between. We did say SHOPPING! There will be artisans in each of the gardens with wonderfully crafted, garden-inspired wares for sale. Look for metal sculpture; nature-impressed pottery; fused-glass creations; handmade concrete stepping stones and wall art; mosaic art pieces; birdhouses and planters created from recycled-wood; glass garden art and planted containers for sun or shade and yes, even plants. Be sure to bring cash and checks, as not all the artisans are able to take credit cards. If you cannot attend, buy a ticket anyway! 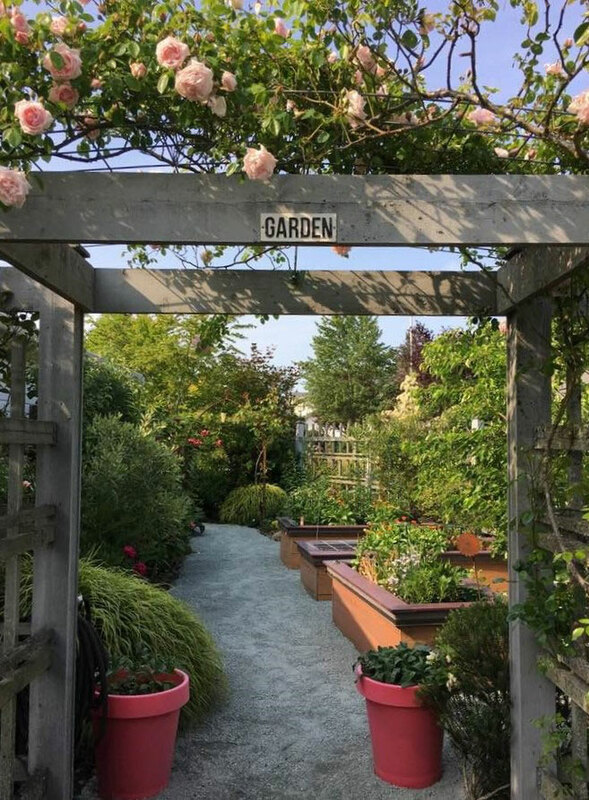 Your ticket purchase enables Mill Creek Garden Club to give back to organizations such as Farmer Frog, local schools and other community, non-profit organizations like the Hope Creek Community Care Garden. The artisans are standing up for Garden Club too; a percentage of their sales goes to the Club’s Grant Program. A $15 ticket is an investment in our community. Tickets are available for $15 per person at Artisan Custom Framing (Mill Creek Town Center), Li’l Sprout Nursery, Bothell Everett Hwy., Mill Creek. Tickets are also sold at McAuliffe’s Valley Nursery, Molbak’s, Sky Nursery, Snohomish Garden Center and Sunnyside Nursery. Please note: IF tickets remain, they are $20 on Tour Day and only available at Li’l Sprout Nursery, 17414 Bothell Everett Hwy., Mill Creek. Celebrate gardens, the arts and our community by experiencing the Mill Creek Garden Tour. Planted containers from Lynn’s Gift & Garden will be sold and her garden will be open on Tour Day. Photo courtesy of Mill Creek Garden Club.